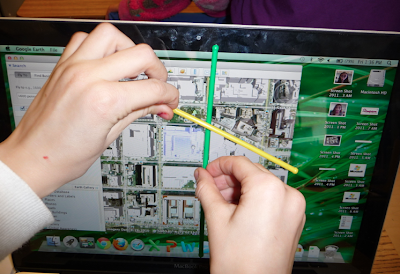 Mrs. Yollis' Classroom Blog: Google Earth Geometry! Mrs. Yollis' student love exploring Google Earth! 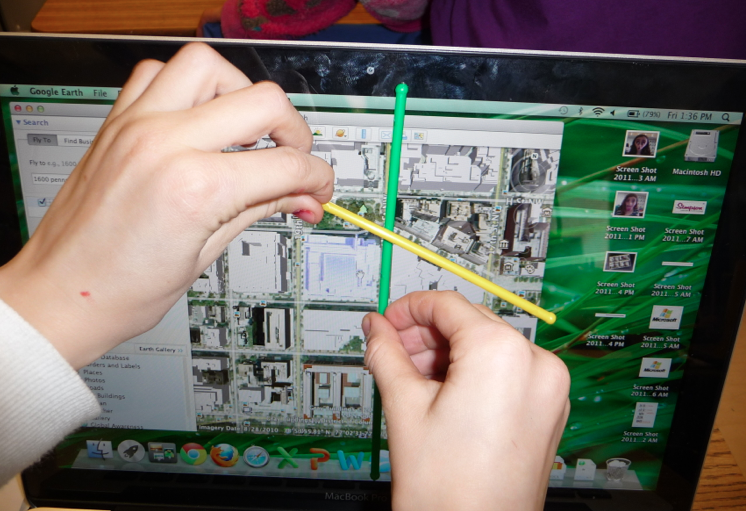 Today, they combined their love of geography with their love of geometry! 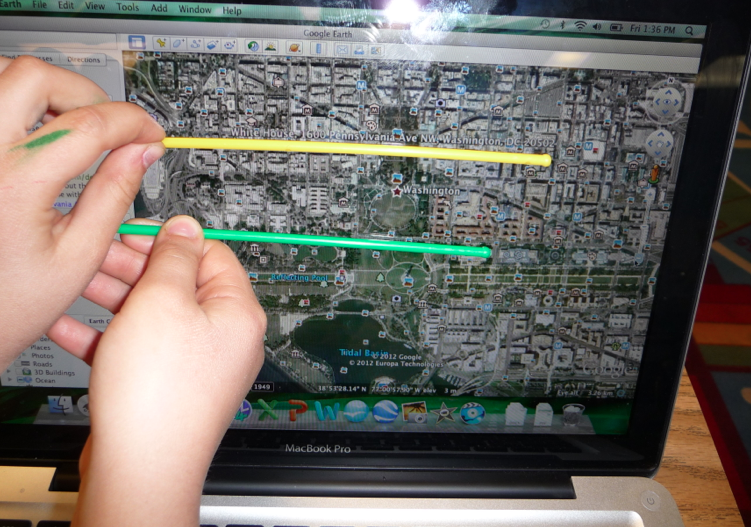 While exploring Washington, D.C., America's capital city, they also searched for 2 and 3-dimentional shapes! The President of the United States lives in the White House. The address is 1600 Pennsylvania Avenue. The White House belongs to all Americans. Notice the columns in front. They are cylinders. Mia discovered that Pennsylvania Avenue is parallel to Constitution for a while, and then Pennsylvania turns in another direction. Logan identified some intersecting streets. Pennsylvania Avenue intersects 19th Street! Here is an aerial shot of the Washington Monument. Around the base of the obelisk is a circle of flags. In addition, there are two other circles around the monument. The top is a square base pyramid. Brenden took a picture of the Washington Monument looking down inside of it. Here is an amazing photograph of the Jefferson Memorial! The dome ceiling appears to be a hemisphere. 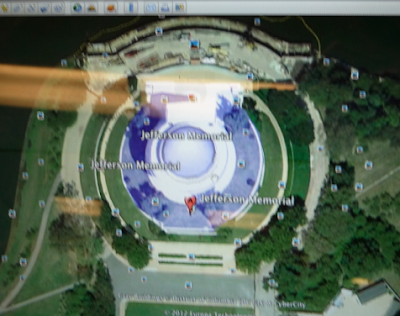 Notice the concentric circles around the memorial. Concentric means shapes that share the same center point. 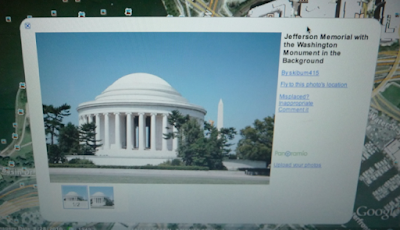 Here is a screen shot of Jefferson Memorial with the Washington Monument in the background. This is a photo of Jefferson Memorial with the statue of Jefferson inside. Without the domed roof, the building is a cylinder. Here is an amazing close up of the Jefferson Memorial statue. It is around 18 feet tall in person. It looks tiny here, but it is HUGE in person! 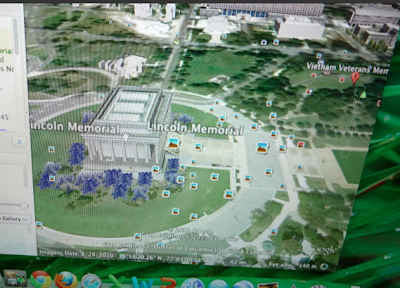 Here is the Lincoln Memorial from the sky! 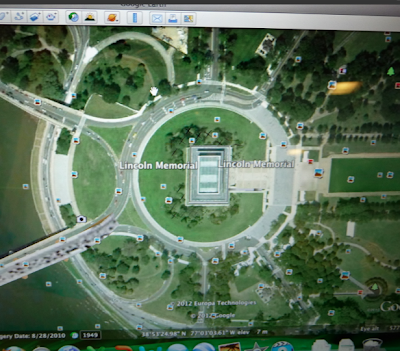 There are intersecting lines, circles, and rectangular prisms on the Lincoln Memorial. In this photograph, the Lincoln Memorial is seen from a different angle. 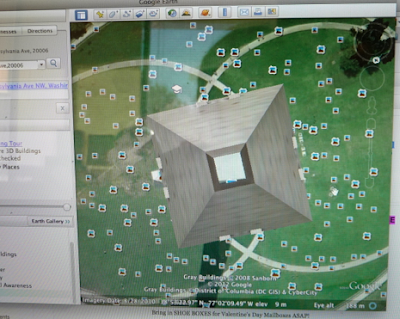 To tilt down in Google Earth, press SHIFT + ARROW down. 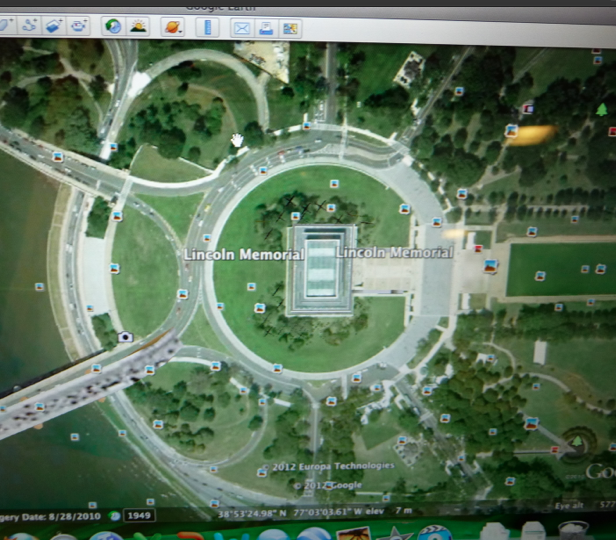 Notice the circle around the Lincoln Memorial. 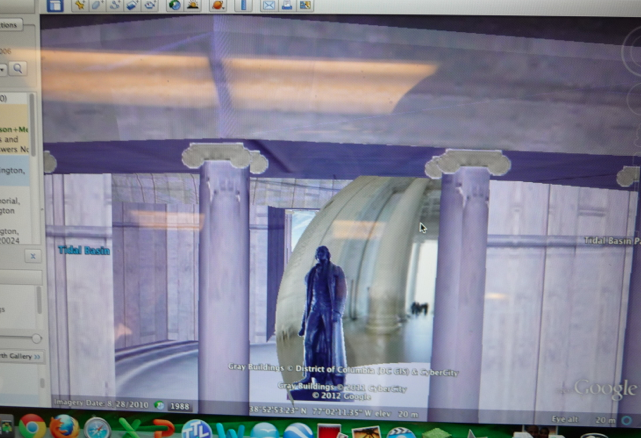 There are columns that look like cylinders holding the Lincoln Memorial up. There are three rectangular prisms on the roof of the Lincoln Memorial. 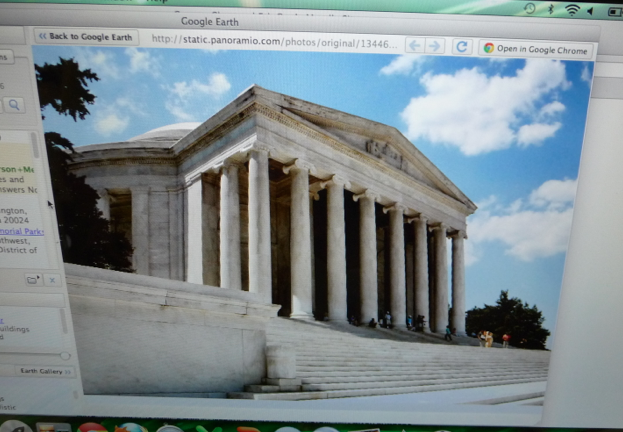 Here is a photo of the Lincoln Memorial. There are cylinders (columns) holding up the Lincoln Memorial. 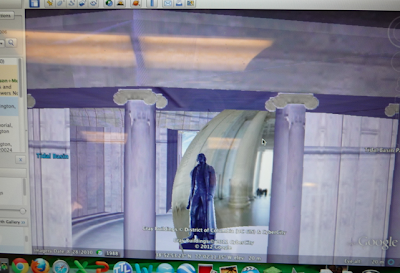 This is the Abraham Lincoln statue inside the Lincoln Memorial! Did you know if you have the 3-D buildings layer on in Google Earth, you can go inside the memorial as well? Try it! This is a gorgeous building! On the front there is a triangle. It is a beauty! Do you know the name of this building? Some students thought it was the Department of Treasury. Others thought is was the Supreme Court Building. 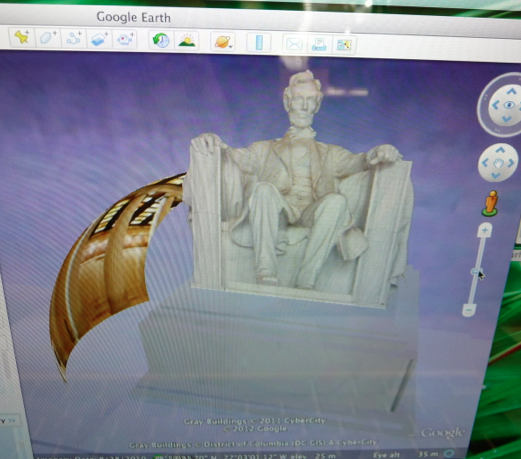 Have you ever used Google Earth? Do you know any facts about these places? 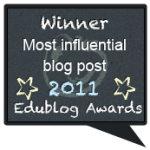 I l♥ve your post! No, I have never been to Washington D.C., but I really want to go someday! Have you ever been there? 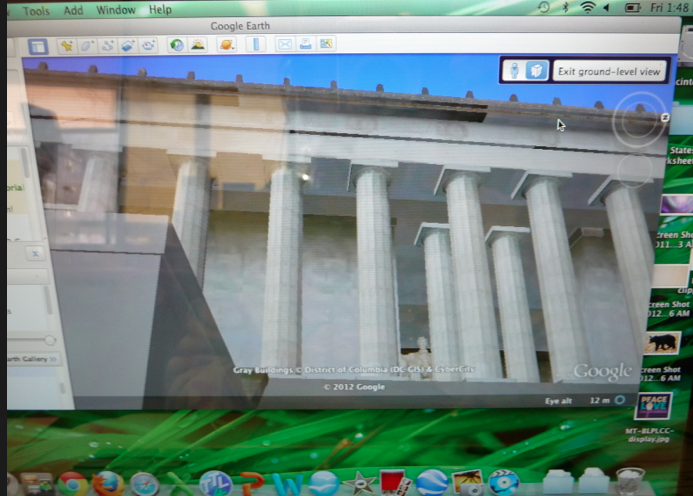 Yes, I obviously have been on Google Earth! 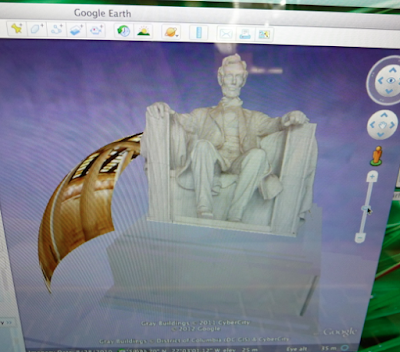 I think that Google Earth is fun, but also think it can be hard! I think that it is sometimes difficult, because you don't get to where you want to go. Also, you can spell things wrong! 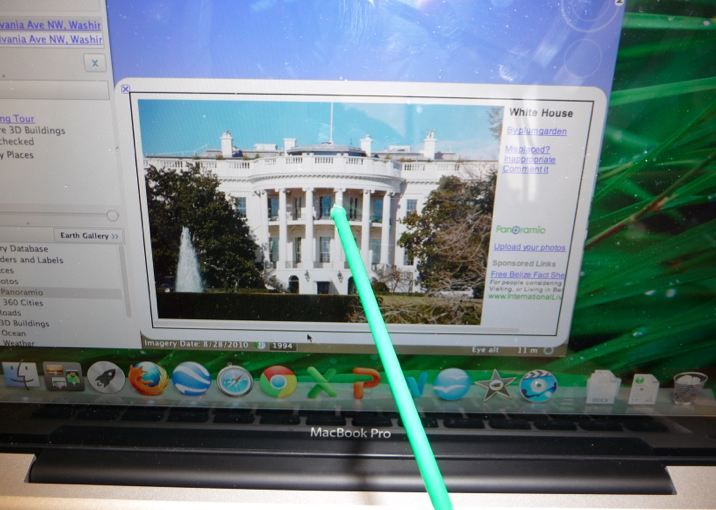 Yes, I have been to Washington DC and I truly loved my time there. It is a fascinating city with so much to see and do. I love the National Zoo, the museums, just everything! Google Earth is wonderful! I don't know how I got along without it. So many ways to explore. 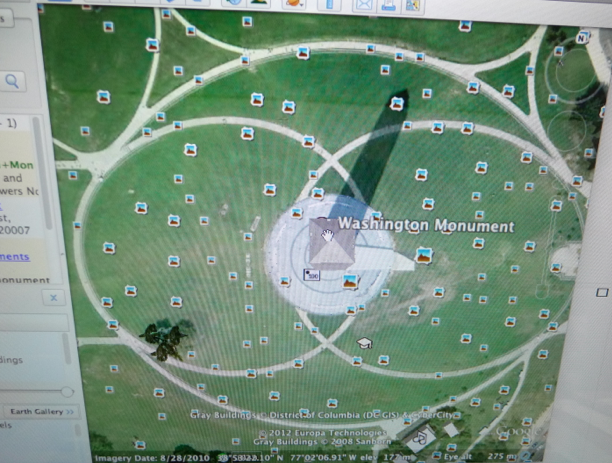 The Washington Monument would make an awesome sun dial! Good job on the post. As you have just learned, the world is made up of geometry. It is everywhere we look, and you will all use geometry for the rest of your lives. I still use it today, especially when driving. I drive parallel to certain streets, perpendicular to others. I use geometry everyday to figure out the quickest way to get where I want to go. So you see, without knowing geometry you cannot drive. So, study away. P.S. 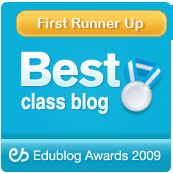 Ask Mrs. Yollis about a "hypotenuse". What a great word to know! 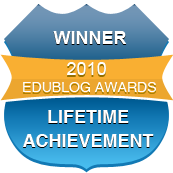 It's the diagonal side of a right triangle, but I call it a "shortcut". 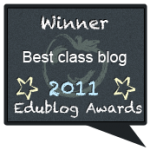 I really enjoyed reading your post about geography and geometry. One interesting fact I learned while visiting Washington D.C. was that the Lincoln Memorial and the Kennedy Center have flat roofs because their lives were cut short. I must admit that I was very impressed when I first saw the giant statue of Abraham Lincoln sitting in his chair. I hope that some day you all get a chance to visit Washington D.C. 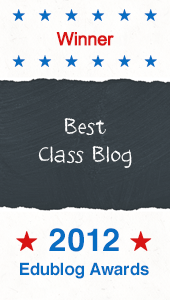 I teach third grade in Yuba City, CA. Our county is home to the smallest mountain range in the world. See if you can visit it on Google Earth. We loved your comment because you gave an interesting fact about the Lincoln Memorial! 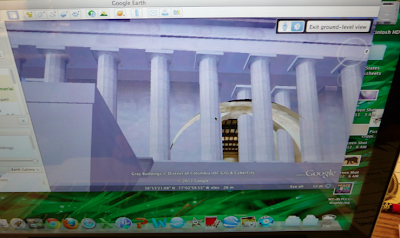 We did not know that the Lincoln Memorial and the Kennedy Center have flat roofs. We have never been to Washington D.C., but we would love to go. 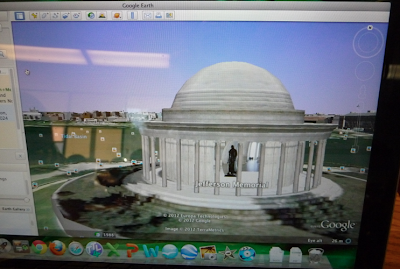 Have you or your third grade students been on Google Earth and found Washington D.C.? What is the mountain range you live in? We hope you continue to leave some quality comments!